Black Star Farms Old Mission, sits just off scenic M-37 amongst the rolling hills and gorgeous views of East Grand Traverse Bay. The former home of locally re-known Underwood Farm market now houses a beautiful tasting room and state of the art wine making and distillation facility. The tasting room boasts a round bar constructed from wine barrels, a cozy fireplace, and a knowledgeable and friendly staff. Taste many of our award-winning wines and brandies, all of which express the regional nature of northwest Michigan. For group tours or other information contact tasting room manager Andy Jacoboson at 231-944-1300 or ajacobson@blackstarfarms.com. BLACK STAR FARMS is a unique agricultural destination that features two winery production facilities with adjacent tasting rooms, a distillery, Inn, and equestrian facility. 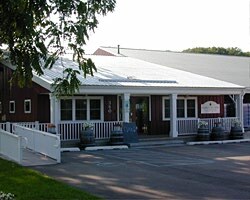 Our winery and distillery produce some of the most sought after and awarded Michigan wines and spirits. Our luxurious Inn is the perfect place to host private special events including weddings, corporate retreats, and family celebrations. Leelanau Cheese’s artisanal cheese … and the Hearth & Vine restaurant add to the culinary offerings at our Suttons Bay site. To try our wines, visit any of our three tasting rooms on the Leelanau and Old Mission Peninsulas as well as TASTES of Black Star Farms in the Village at Grand Traverse Commons in Traverse City or order online.